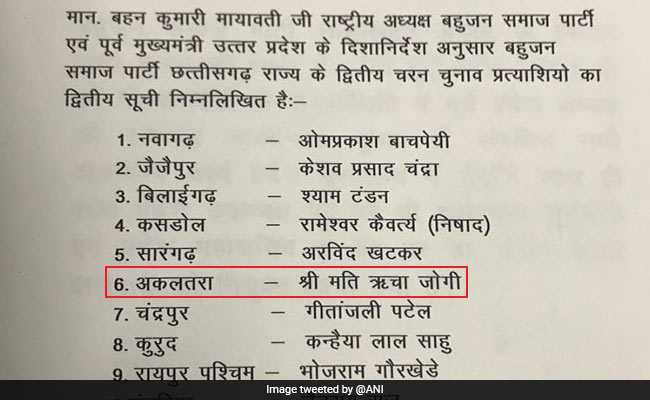 As the Chhattisgarh Assembly elections are inching closer, the Bahujan Samaj Party (BSP) has released the second list of candidates for the upcoming polls, which includes Janata Congress Chhattisgarh (JCC) founder Ajit Jogi's daughter-in-law Richa Jogi's name. As mentioned in the list of candidates, the former Chhattisgarh chief minister's daughter-in-law will be contesting polls from Akaltara constituency in Janjgir-Champa district. Akaltara seat is at present being represented by Chunnilal Sahu of Congress. It is believed that Richa Jogi has played a major role in building the two-year-old party founded by Ajit Jogi after he broke away from the Congress in 2016. The four-member Jogi family, comprising Ajit, his wife Renu, son Amit and daughter-in-law Richa, now belong to three political parties- JCC, BSP and the Congress. On Friday, Amit Jogi announced that his father Ajit will not contest the upcoming state assembly elections, but will instead campaign for the alliance parties. The Assembly elections are scheduled to be held in two phases on November 12 and 20. The results will be announced on December 11.